Thalian Hall (panoramic) in Wilmington, NC; photo by Mark Lee (pochacco20) on Flickr (use permitted with attribution / no derivative works). North Carolina designated the Thalian Association as the official state community theater in 1975 (Thalia was the muse of comedy and pastoral poetry in Greek mythology). 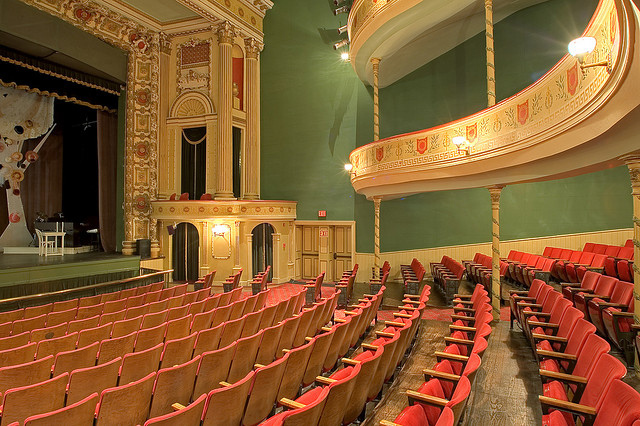 Wilmington's gorgeous historic Thalian Hall was built in 1858 and has been restored to its original appearance. In addition to offering community theater, special events, and children's theater, Thalian Hall is a regular location for films and shows such as "Dream A Little Dream" "Sleeping With The Enemy," "Young Indiana Jones," "Matlock," and "Dawson’s Creek." "The Thalian Association is a non-profit ... organization dedicated to enriching the artistic environment of the Cape Fear region. Tracing its roots back to 1788, (the) Thalian Association was founded for the purpose of bringing arts education and performing arts to Wilmington." Thalian community theater (Thalian Hall); photo by Mark Lee on Flickr (use permitted with attribution / no derivative works).